Flexible and scalable power metering options that are capable of metering power quality in addition to basic power and energy metering. ME96SS Series power meters are high accuracy meters for electrical load monitoring. 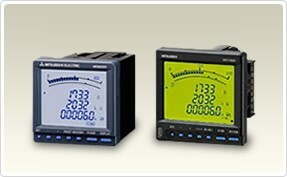 They are panel mount meters with a large LCD display and native Modbus RTU or optional CC-Link communication. ME96 can be installed on power distribution panels, motor control centers, machine panels or other custom panels. ME96SS meters provide metering and power quality information that can be used for energy cost allocation, power demand management, or troubleshooting power quality problems.